A local group of 100 Women Who Care supported a nonprofit organization that provides support in the immediate hours after a tragedy. 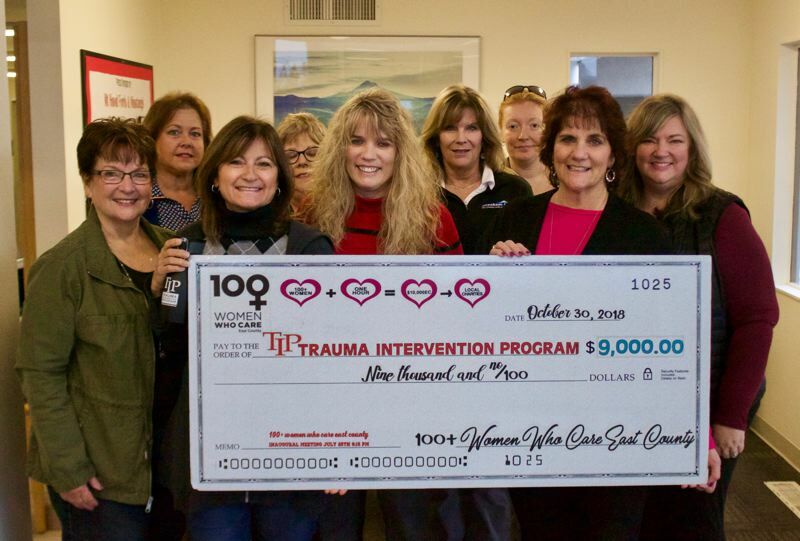 During their second-ever meeting, 100 Women Who Care East County voted to donate money as a group to the Trauma Intervention Program. They presented TIP with a check for $9,000 Tuesday morning, Oct. 30, and eventually the total money given will be $9,100. "This donation is huge. It would usually take me months to plan and fundraise this amount," said June Vining, executive director of TIP. "We can use this to train more volunteers and provide supplies and resources." TIP is a group of specially trained citizen volunteers who provide emotional aid, practical support and resources to victims of traumatic events and their families. TIP Volunteers are available 24 hours a day, all year. They are called by emergency responders to help during unexpected deaths, violent crimes, fires, car crashes, attempted suicides and more. The group does a lot of work in East Multnomah County. "It's great having the opportunity to spread the word about our organization and help more people in need," Vining said. 100 Women Who Care is a group of forward-thinking community members that gathers four times a year for one-hour meetings. They learn about local charities and each donate a $100 check to the nonprofit selected by the group through a popular vote. The combined donation makes a real impact, without any time-consuming fundraising events or planning. During their latest meeting, the other two organizations considered were Embrace Oregon and the Salvation Army. 100 Women East County is currently at 95 members, with a goal to have 125 or more by the February 2019 meeting. For more information, or to become a member, visit http://100womenwhocareeastcounty.org.